Buzzing sounds as a mean of intra species-specific communication during agonistic encounters in male European lobsters (Homarus gammarus)? Could lobsters use sounds to communicate between each others ? An important application of marine ecological knowledge today is designing new indicators of marine ecosystems’ health. Passive acoustics, which simply consists on listening to sounds, is promising because it is non invasive and non destructive. However to develop passive acoustics as a tool for monitoring, we need to identify sound-emitting species with high potential for this type of application. Then, the sounds need to be analysed and and understood within their ecological context. In the coastal waters of Brittany (France), crustaceans would seem to be good study model, because they emit a wide range of sounds and also have a high commercial and cultural importance. My PhD research, is focussed on the European lobster (Homarus gammarus, Figure 1). 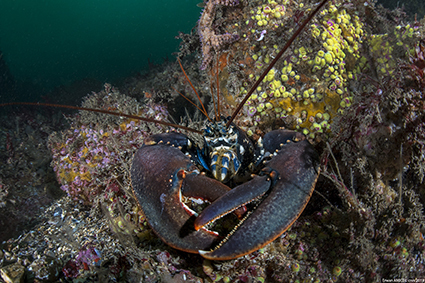 In our first study, we have shown that when stressed, the European lobster produces a species-specific sound that we call a “buzz” (Jézéquel et al. 2018, insert link for sound file). These sounds are characteristic low frequency and continuous sounds. We have shown that they are similar to those produced by the American lobster, but we . While no studies have described the behaviours of the European lobster with ethograms (sequences of observed behaviours during behavioural experiments), there is a large literature on behaviours of American lobsters. Researchers have found that male American lobsters use agonistic encounters through aggressive behaviours to establish dominance between individuals (Figure 2A). This allows them to gain access more easily to shelters and suitable mates during reproduction periods. These researchers have also shown that visual and chemical signals are used, but no studies have reported the use of sounds during these events to communicate. In our study, we have done agonistic encounters with male European lobsters to understand if they use sounds as a mean of intra species-specific communication (Figure2B). 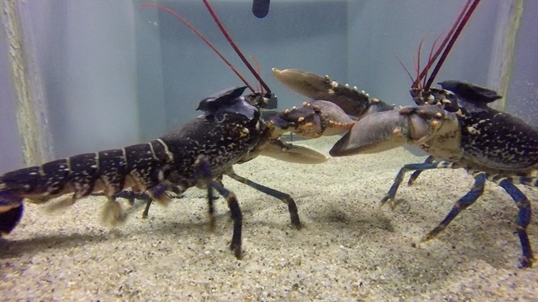 Our results show that male European lobsters use a highly complex panel of behaviours, from physical display to aggressive claw contact, in order to establish dominance. Once the dominant and submissive individuals are determined, they each adopt different behaviours: the “winners” (dominants) continue physical and aggressive displays toward the submissive individuals that attempt to escape from their opponent’s presence. During these experiments, we did not record buzzing sounds, probably because of the poor propagation of low frequencies (like those of the buzzing sounds) in the experimental tanks. We concluded that this could explain the non detection of these sounds by the hydrophones installed for the experiments (Jézéquel et al. 2018). The mechanism of sound production in both American and European lobsters is known: they contract rapidly internal muscles located at the base of their antennas to vibrate their carapace which produces the buzzing sound. We completed a new series of agonistic encounters with male European lobsters, but this time adding high frequency sampling accelerometers on their carapace. 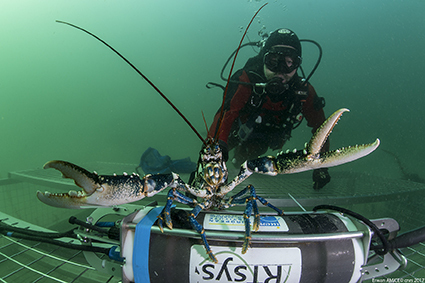 The accelerometery data clearly showed that European lobsters vibrated their carapace during agonistic encounters (with up to 90 vibration episodes per 15 minutes of experiment per individual), but their associated buzzing sounds were not recorded with hydrophones. Carapace vibrations were emitted by both dominant and submissive individuals, even if submissive individuals produced significantly more vibration episodes than dominant ones. These vibrations were associated to particular behaviours such as physical display and fleeing. We have shown for the first time that male European lobsters exhibit complex, rapid patterns of movements during agonistic encounters that include carapace vibration episodes. However during these events, the reactions of the receivers toward these signals remain unclear. We remain uncertain if the lobsters “sense” the carapace vibrations or their associated buzzing sounds in the experimental tanks. 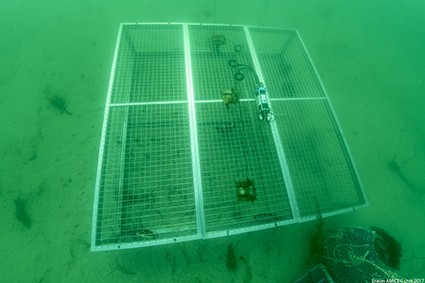 Even if it is too soon yet to talk about a new type of communication in crustaceans, we have shown that buzzing sounds might have a role in the intra species-specific interactions displayed during agonistic encounters between male European lobsters. Field experiments with better sound propagation conditions are in progress to determine if these sounds are indeed used as a mean of communication (Figure 3).